This page will include Die-cast 1/25 to 1/6 scale motorcycles of Harley Davidson, Indian and more. They were made by Ertl American Muscle, Highway 61, Miasto, Xonex and more. 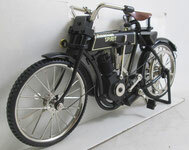 Xonex 1903 American Spirit Motorcycle in diecast. Large 1/6 scale (10 in long) with turning wheels and steering. Certificate Missing. New in Box, Opened only for photos. Yat Ming Stk# 98000 Yamaha Royal Star Motorcycle in diecast. 1/18 scale (5-1/2 in long) with turning wheels and steering. New in Box, Opened only for photos.